Adopted brother and archenemy to Asgardian prince and Avenger Thor, Loki is a supervillain based on the mythological Norse trickster god of the same name. First appearing in opposition to Thor in 1962, Loki has since gone through several reiterations and reincarnations. A Frost Giant, he is inherently gifted with enhanced strength, speed, and stamina. A master schemer and manipulator, he can also shapeshift into a variety of forms, making him a particularly enigmatic opponent. Appearing in a variety of Marvel comics, TV shows, video games, and most recently in the Marvel Cinematic Universe, Loki has amassed a following of devoted fans. Here at Superheroes Direct, we provide these fans with a variety of collectibles and apparel featuring this devious villain. 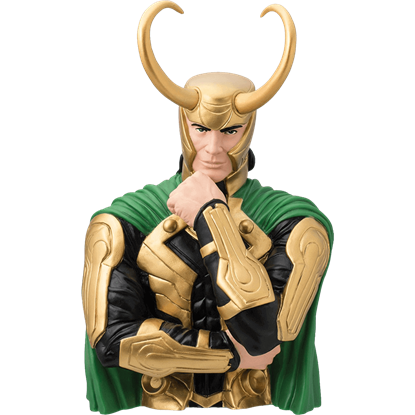 Our selection of Loki statues and figures includes paperweights, bust banks, POP figures, and more. Loki heat change mugs and other drinkware feature the Frost Giant alongside other iconic enemies of the Avengers, while our t-shirts and accessories make the perfect gift for any Loki fan. Loki is the adopted son of Odin and younger foster brother of Thor. He resents the attention that Thor, who is crown prince of Asgard, receives. 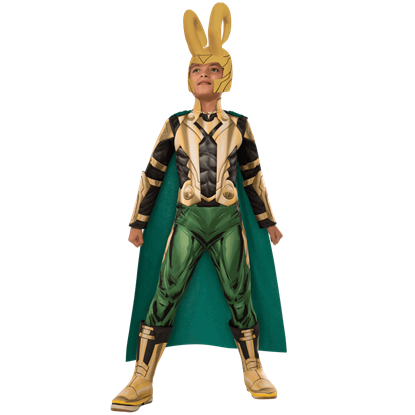 This Kids Deluxe Loki Muscle Costume is based on his classic look from Marvel comics. While you would normally not trust the God of Mischief with your money, you do not need to worry! This Loki Bust Bank is not the real Loki, only an incredibly detailed and stunning replica that any fan will be sure to absolutely love. One can search the galaxy far and wide for a trickster but look no further than this Loki Sculpted Mug. 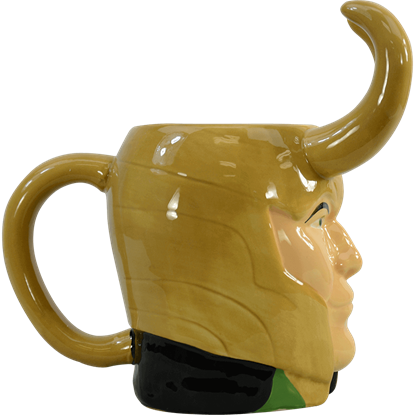 With this mug you can be as sly and witty as Loki while confusing the most steadfast of Norse gods. The supervillain Loki is both adoptive brother and nemesis of Thor, possessing magical and shapeshifting abilities. 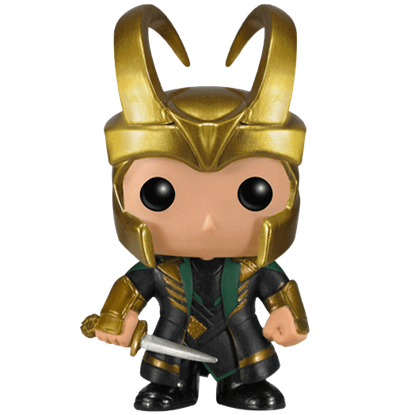 The Marvel Loki POP Figure depicts the movie version of this character as a chibi-style bobble-head doll.